In addition to what was mentioned in my previous post, I continue to cope with what I strongly suspect is the most annoying, persistent, frustrating, and ultimately depressing case of internalized homophobia that a gay guy could possibly have, and I'm not being sarcastic. This is the beast that needs to be slain! This button sums up the situation nicely! The condition is a direct result of my staunch Catholic upbringing along with disparaging attitudes from society in general during my childhood, which is an environment that I had to live in throughout my teens up until my mid to late 20's. Essentially, because I was hardwired as a kid to be afraid of being openly gay and was taught to believe that there was something wrong or abnormal with being homosexual, I have those same irrational instincts as an adult. Logically, I know that my gayness is perfectly natural yet at times I have difficulty with expressing it no matter how much I may want to. For example, I went to the mall the other day (in the summer of 2016) to speak with a sales rep who turned out to be a very cute young guy in his 20s. He had a very chatty, friendly demeanor, and long hair that looked really attractive on him. If I were 15 years younger he would be the kind of guy I'd want to go out with. While we were talking I got the sense that he might be gay (which gay folks refer to as "gaydar") and found myself becoming more curious about him, impulsively studying him to see if he really was gay. In that moment when I was experiencing those gay feelings of attraction for him I suddenly became fearful about being gay, rather than feeling good about it. As such, I ended the conversation with him quickly and left the store in order to avoid feeling attracted to him. This is a completely irrational response for me to have toward my own gayness, but the fearfulness just keeps dogging me. Doing away with my internalized homophobia would make me feel like this guy! Thankfully my internalized homophobia doesn't affect me all of the time. As I mentioned earlier in another post, I do have gay friends and have had a few boyfriends in the past. However my internalized homophobia has prevented me on many, many occasions from simply being myself and saying what is actually on my mind. In the past it has caused me to miss out on making new gay friends, talking with cute guys that I'd want to go out with, using my gaydar to meet gay guys who might not be out, making myself open to having a steady boyfriend, flirting back with a guy who is flirting with me, being openly gay in general, and establishing a long term relationship with a partner. Dealing with internalized homophobia isn't as simple as just saying "get over it already". To do so would be dismissing it as trivial which is not helpful at all. Internalized homophobia is a complex issue that requires a tremendous amount of patience and understanding to sort through as you work to peel back the layers and expose irrational thoughts. More importantly, it's critical for me to remind myself that this internalized homophobia is not my fault. It is the result of being mentally abused during my childhood when I was forced to conform. When, as a boy, I was made to feel so fearful about my natural gay feelings that I am still fearful at times even as an adult. 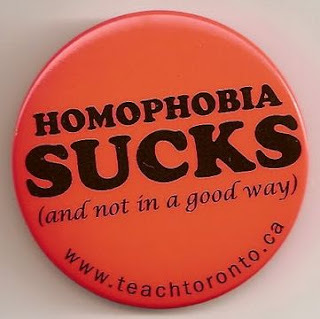 As I understand it, when it comes to living in an intolerant social environment, those who are aware of their gayness when they are a child or in their teens are more at risk of developing internalized homophobia, where as those who become aware of their gayness in their 20s or as an adult are less at risk. Fortunately today society is far more tolerant than it used to be, which certainly helps a great deal to counteract such internalized homophobia, but it would still be presumptuous to assume that gay folks don't have to deal with this issue anymore. Depending on a person's family culture or religion, it could still be quite challenging to be gay in certain situations. Certainly, my Catholic upbringing didn't help matters for me, and the church still hasn't changed their teachings, so anyone living in a Catholic family today could still potentially develop some degree of internalized homophobia. In order to overcome my own internalized homophobia, I have to push through my instinctual, irrational fear and acknowledge that I am gay both to myself and in social situations. I need to acknowledge the struggle that I'm having with being gay and talk more openly about it in order to diminish the feelings of fear that are the root cause of the homophobia. To that end, I've taken the bold step posting my coming out story online, I've launched Mikey's Fabulous Gay Blog and I've even included this post discussing internalized homophobia! Take that nasty dragon!